When Marriages Go Astray: Choices Made, Choices Challenged is an account of inter-caste and inter-religious marriages and presents detailed case studies from Bishnupur, a town in West Bengal. 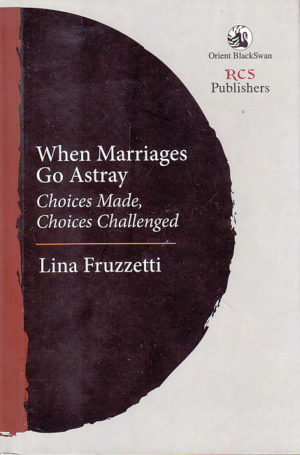 In this study, Lina Fruzzetti looks into a rarely studied aspect of female agency in India: how can we understand society’s concern with marriages deemed to have gone astray? How do women cope with their families’ rejection of their choices? Categories: Gender, Publisher, RCS Publishers. Tags: 9788192304625, Bengali women, Gender studies, Inter-caste marriage, Inter-religious marriage, Lina Fruzzetti. When Marriages Go Astray addresses women’s dilemma in selecting one’s marriage partner in a society still bound by the tradition of arranging marriages for their children. Fruzzetti analyzes the discourse of how these young women set about negotiating new boundaries by denying their imposed ideal as custodians and preservers of tradition. Instead of acquiescing to rules and cultural obligations, they decide to navigate the confines of culture and their decision often sets them against kinship, family, or even one’s faith, notably in cases requiring conversion to a new religion. These women realise that in asserting their ‘freedom to choose’ they face conflict with the expectations of their upbringing and pose challenges of acceptability to their families, society, caste, and occasionally religious communities.